How do my expectations about a task influence how motivated I am to perform the task well? According to Vroom, there are three types of expectations that influence motivation: 1) Expectancy, 2) Instrumentality, and 3) Valence. These three influence if and how much effort we put into a task and our perceived probability of success. It affects all the choices we make. Expectancy is the perceived probability that effort will lead to a good performance. Logically, this perception is influenced by our belief in our abilities to perform tasks in general (self-efficacy), the difficulty of the task and our perception of the amount of control we can exercise on reaching the outcome. 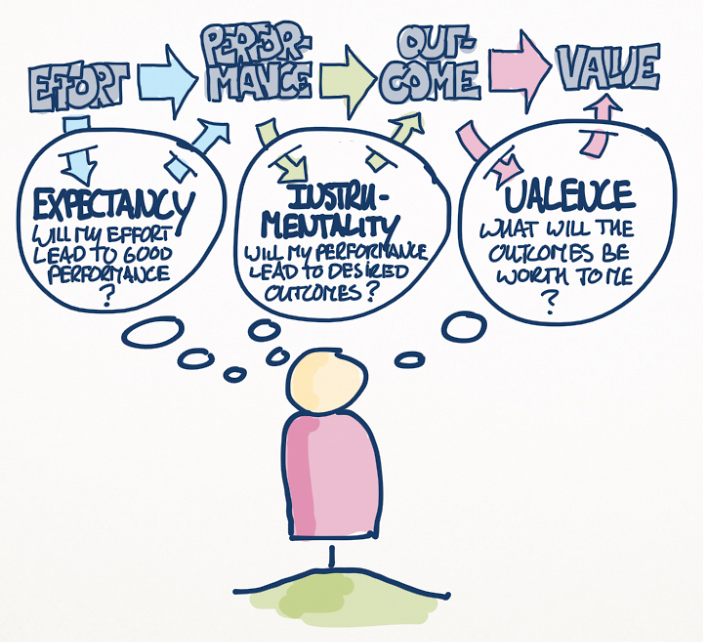 Instrumentality describes our perception on how likely it is that our performance leads to desired outcomes, like recognition from others, a reward, or a sense of accomplishment. There is an element of trust related to this expectation, as some outcomes might come from within ourselves, but others are provided by other people in our environment. Do we trust good performance will be rewarded? Finally, valence is what we expect will be the value of the outcomes to us. If positive, logically, we are likely to put in the effort and perform the task, if negative we will avoid it, and if neutral we are indifferent.